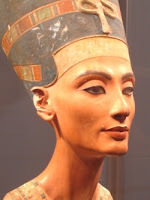 There's more to the eye makeup that gave Queen Nefertiti and other ancient Egyptian royals those stupendous gazes and legendary beauty than meets the eye. Scientists in France are reporting that the alluring eye makeup also may have been used to help prevent or treat eye disease by doubling as an infection-fighter. Christian Amatore, Philippe Walter, and colleagues note that thousands of years ago the ancient Egyptians used lead-based substances as cosmetics, including an ingredient in black eye makeup. Some Egyptians believed that this makeup also had a "magical" role in which the ancient gods Horus and Ra would protect wearers against several illnesses. Until now, however, modern scientists largely dismissed that possibility, knowing that lead-based substances can be quite toxic. In earlier research, the scientists analyzed 52 samples from ancient Egyptian makeup containers preserved in the Louvre museum in Paris. They identified four different lead-based substances in the makeup. In the new study, they found that the substances boosted production of nitric oxide by up to 240 per cent in cultured human skin cells. Modern scientists recognize nitric oxide as a key signalling agent in the body. Its roles include revving-up the immune system to help fight disease. Eye infections caused by bacteria can be a serious problem in tropical marshy areas such as the Nile area during floods, the scientists note. Therefore, the ancient Egyptians may have deliberately used these lead-based cosmetics to help prevent or treat eye disease, the researchers suggest, noting that two of the compounds do not occur naturally and must have been synthesized by ancient Egyptian "chemists."